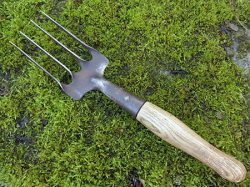 Vintage English Hand Fork. 4 twist tine Steel blade with socketed ash handle. Handle slightly frayed at end may add character? Blade stamped 'Brades Co' celebrated manufacturer. 13 inches (33cms).